Ever since they began their company in 1957, Shiny has been making rubber stamps of high standards. They create durable models built to last for many years. With our selection of Shiny custom daters, you can get the longevity and performance you deserve. 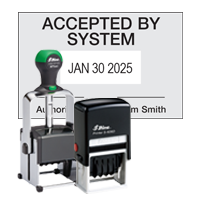 For many professions, having a reliable dater stamp on hand makes the difference between a job done quickly and efficiently and a time-consuming task riddled with possible errors. With our selection of Shiny custom daters, you can perform a range of essential tasks with ease and speed. When choosing a long-lasting product offering superior performance, Shiny is one of the most respected brands available. Our inventory of Shiny customer daters includes self-inked options, non-self-inked options, and heavy duty designs. All of the Shiny custom daters we offer have been made with the highest standards of quality and performance. The ink pads can last for up to 10,000 impressions before needing to be replaced. 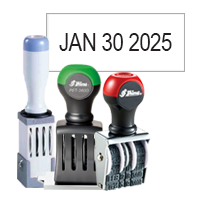 Choose from mini daters perfect for stamping on the go or larger, heavy-duty options with sturdy frames and easy grip handles ideal for repeated stamping without strain. Once you have chosen your preferred model, choose from 11 different ink colors to find the one that is right for your need. We offer different ink types as well, including fast-drying options to save on time. 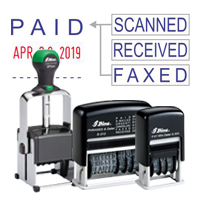 While these daters are often used with numbers for tracking dates for various reasons, they can also be made with letters to allow for adjustable stamping of important words such as RECEIVED, APPROVED, PAID, and other needed phrases to make life easier. Not sure which stamp would be best for your particular needs? Our staff would be happy to help you find the best option for you! At Rubber Stamp Champ, we have over twenty years of experience in creating custom stamps of exceptional quality. We use the latest in laser engraving techniques and offer products from leading names in the business for quality you can count on. If you have any questions, we would be happy to help. Call or order online today!